Every time your heart beats, it pushes blood out to your entire body. The blood moves through blood vessels called arteries. The term blood pressure refers to how hard the blood is pressing against the walls of your arteries. When your heart contracts, blood is forced out of the heart and the pressure increases. When your heart relaxes, the pressure decreases. High blood pressure, or “hypertension,” often has no obvious cause, although many factors can contribute. When you have high blood pressure, your blood vessels are too narrow (constricted) or they may have too much blood volume circulating in them. High blood pressure puts an additional strain on blood vessels throughout your body and increases the workload on the heart. What should my numbers be? It’s possible for only ONE of the numbers to be high (the systolic or diastolic). 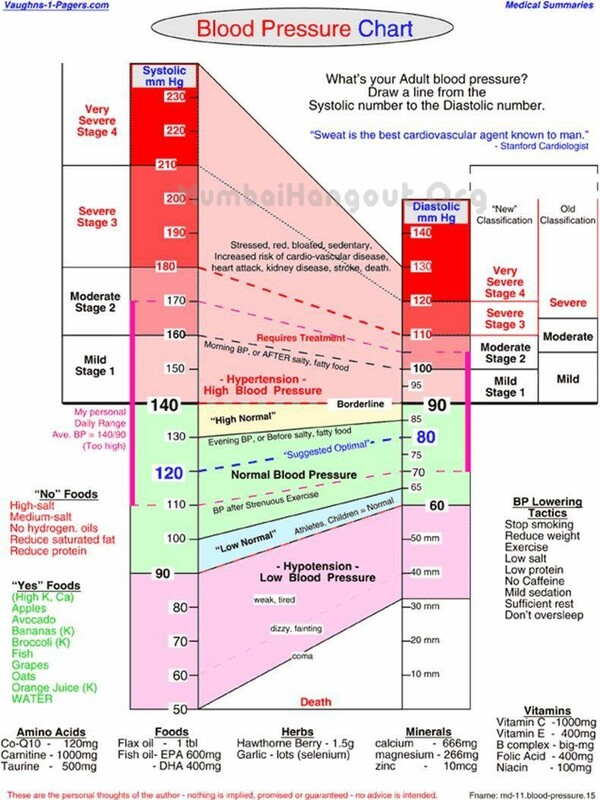 It is particularly important to keep an eye on a high systolic number. Diastolic pressure is the blood pressure when the heart is relaxed. Buy and use a blood pressure monitor.Compare your BP reading with the numbers on the chart above. Draw a line from your systolic pressure to your diastolic pressure.Is the slope of the line about the same as shown on the chart? Where do YOU fit in? What are your risk factors?Are your blood pressure readings within the normal blood pressure range? Should you take anti-hypertension medication to lower your blood pressure? Normal human daily Blood Pressure Range can vary widely, so any single blood pressure monitor reading is not reliable. BP monitor readings must be taken at different times of day, to determine AVERAGE blood pressure over time. What is important is your AVERAGE BP, or MAP (Mean Arterial Pressure) over time. Or, where are those numbers sitting MOST of the time? Normal MAP is about 93 mm of mercury. A MUST WATCH for those with high cholesterol but too lazy to read up about it.